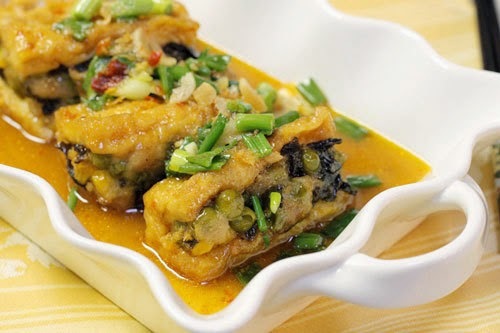 When you get bored with boring daily meals, Fried Tofu with Sweet and Sour Filling (Đậu Phụ Nhồi Sốt Chua Ngọt) is a good choice. Like today, I do not want to eat any thing after the special holiday – lunar new year festival. 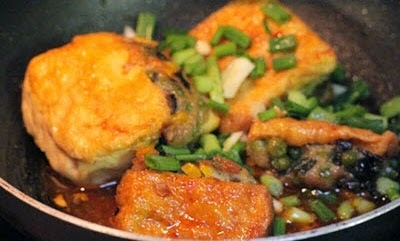 I and my mom decided to make one of stunning Vietnamese Food Recipes like this dish for our family. My mom told me it is better when we enjoy with boiled rice and hot soup. If you love spicy, you can eat with chili fruit. Wow, I cannot explain its amazing feeling for you guys until you have a chance to taste it. And if you want to cook one of stunning Vietnamese Food Recipes like this one with us, please follow our instructions below and let us start cooking right now. Are you ready? Step 1: Clean fresh tofu carefully. Cut in half. 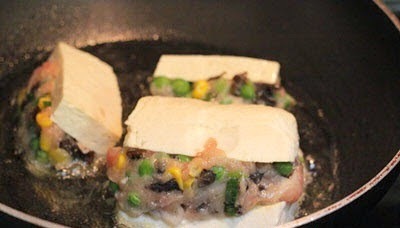 Then, use knife to pierce a hole on the centre of tofu. 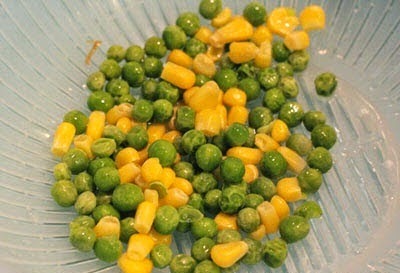 Step 2: Clean green peas + corn seeds. Wait to dry. 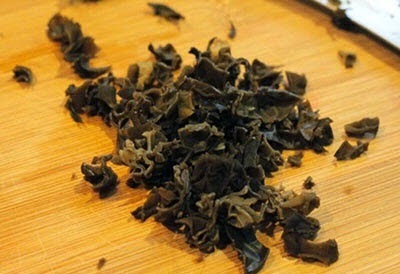 Step 3: Soak Jelly’s ear mushrooms into water in 10 – 15 minutes. Cut off the roots and slice small. Step 4: Here is the first step to create the flavor for one of amazing Vietnamese Food Recipes for your family today. 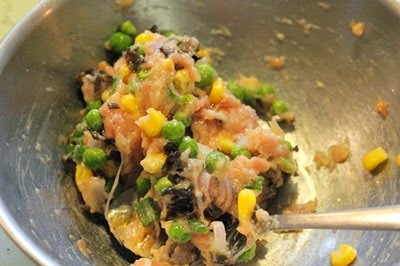 Mix grinded pork with sliced jelly’s ear mushroom + corn seeds + green peas. Marinate with a little pepper, + 1 teaspoon salt + ½ teaspoon sugar + 1 teaspoon fish sauce. Wait in 15 – 30 minutes. 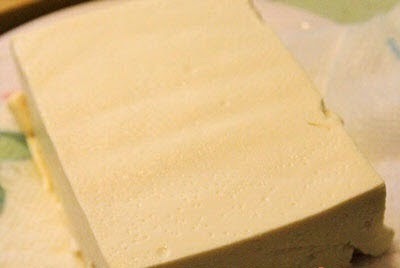 Step 5: Use spoon to scoop a little filling in step 4 and stuff into the center of tofu. 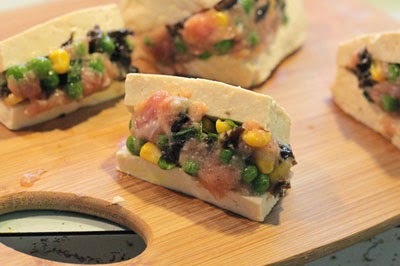 Do this process until filling and sliced tofu are out. 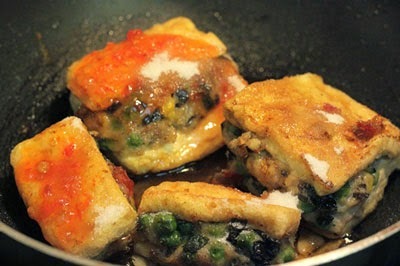 Step 6: Heat to oil and bring tofu in step 5 to fry until their faces turn brown yellow. Step 7: Put them on paper napkin to absorb all wasted oil. Step 8: Add 2 teaspoons oil into another pan, add more fried tofu in step 7 + 2 tablespoon sweet and sour chili sauce + 1 teaspoon soya sauce + 1 tablespoon sugar + 2 tablespoons fish sauce and cook until it boils. Step 9: Then, add more 1 tablespoon water and continue to cook until water is nearly run out. Season again to suit your flavor. Finally, you just finished one of stunning Vietnamese Food Recipes for your beloved family. Sprinkle a little sliced spring onion before serving. I suggest you should eating when it is hot with boiled rice. I bet you will not regret about this decision. 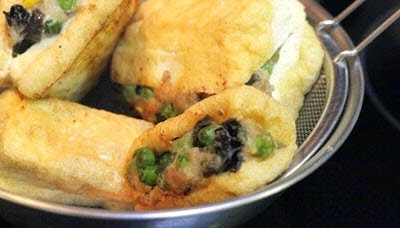 Hope you love cooking this dish and Good Luck for your Cooking.